Similar to the Neil Young Live concert on Facebook, but this ‘secret’ event seems much better publicized. Be interesting to hear the audio quality, as well as to see how many people ‘go’. 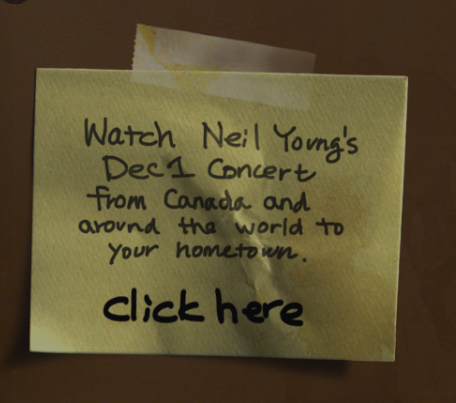 Neil Young – Live in Omemee, Ontario. Very intimate. Played by himself in a small hall built by the same architect who built Massey Hall [where a somewhat recent live album was recorded]. He played mostly old standards with a few new songs, often politically relevant, thrown into the mix. He played on a several acoustic guitars, two pianos, at least two harmonicas and an organ. This is my favorite style of Neil Young concert. By far. Even though I love his electronic stuff and his, uh, more experimental stuff [and love that he does, in fact, experiment with different music genres]. But the intimate venue, with his ability to put so much emotion into his voice [and last night his instruments as well], with the emotional responses from the audience so readily audible, it is just such an honest and forthright and compassionate and human an experience. Hard to find these these days where the vibe is more, as he put it, “bringing out some old ideas – like marching criminals through the streets”. We watched it streaming on Facebook. It was also shown live on a Canadian TV network. He mentioned the live stream a few times. Neil seems to have a love hate relationship with technology. I remember him working many years ago with Sun Microsystems [now Oracle] to develop a fuel-less car [out of an old Chevy or something. Sorry, too lazy to look it up myself]. And of course more recently PONO [the technology of which is now branded as MQA… without, it appears to me, Neil’s okeedokee]. Sonically, the sound was good. As good as these things ever get, I think, from listening to lots of YouTube music concerts over the years. The Facebook player kind of stopped working after about an hour, and we had to reload the page finally, missing the first half of Helpless. The bass on the at least one guitar didn’t decay as rapidly as one might expect, but this might have been the way that it really sounded. And they sounded awesome. I was thinking that if I ever got another acoustic guitar, I wanted it sound like these. These, old, beat-up, obviously well-loved guitars. I do not think any of the soundboards [the area around the sound hole] had any color left on them, the finish and maybe even the veneer [if any] worn clear through. He spent sometime showing how a guitar from Steven Stills, who purportedly got it from a musician who got shot while playing a Neil Young song [kind of a wink at fake news], and showed how the front soundboard had a significant area of the wood replaced, where the bullet went in, and how he had finessed the place where it came out [if this was truly a bullet’s trajectory, my guess is that it would have missed the musician at the time]. Guitar sounded great by the way. Similarly, he brought his very old pianos with him as well up here into the wilderness of Canada [and we complain about shipping speakers up there]. And an old tree stump that was given to him by the “First Nations” down in Nebraska many years ago when trying to bring attention to the problems caused when we try to run leaky oil pipelines long distances. The concert was both a homecoming of sorts and an attempt to raise money for the school where his father went. It also helped publicize that the Neil Young Archives are now open [recommend logging in with Facebook or Google and NOT TYPING YOUR PASSWORD there – it is an unsecure page]. The songs of the new albums sounded great, can’t wait to add it to our collection [one of our largest]. Neil Young – always from the heart and still relevant after all these years.